Received April 30, 2018; Revised May 31, 2018; Accepted July 16, 2018. 발치와에 치조제 보존술을 시행한 부위에 식립한 임플란트의 일정 기간의 생존율을 초기고정 값과 방사선학적 계측을 통해 분석해보고자 하였다. 19명의 환자에 sandblasted, large-grit, acid-etched (SLA) 표면을 갖는 단일 제품의 21개의 임플란트를 조사하였다. 임플란트는 치조제 보존술(Alveolar ridge preservation technique: ARP) 시행 후 2 - 3개월의 치유 기간 후 식립 되었으며, 식립 시 및 보철 시행 전 Periotest value (PTV)와 식립 시 및 최종 점검시의 방사선 사진을 통한 Marginal bone level (MBL)의 변화를 측정하였다. 전체 임플란트의 생존율은 100%로 나타났고 식립 시의 PTV는 평균 -0.06 ± 8.33이었으며 보철 시행 전 PTV는 평균 -5.75 ± 1.72이었다. 근 원심 평균 MBL의 변화는 -0.55 mm에서 1.6 mm의 범위로 평균 0.19 ± 0.58 mm를 나타내었다. 발치와 보존술을 시행한 부위에 식립한 임플란트는 높은 생존율을 나타내며 안정적인 변연골 유지를 보이는 것으로 사료된다. The purpose of present study was to retrospectively analyze the survival rate of implant placed after alveolar ridge preservation by initial stability and radiographic measurements. In total, 19 patients who received 21 sandblasted, large-grit, acid-etched (SLA) implants were enrolled in this retrospective study. Implants placed after alveolar ridge preservation technique (ARP) 2 - 3 months healing period, Periotest value (PTV) measured at implant placement and before placed prosthodontics. Marginal bone level (MBL) was measured at implant placement and final recall check. Overall survival rate of implant was 100%. Mean PTV at implant placement was -0.06 ± 8.33 and mean PTV before placed prosthodontics was -5.75 ± 1.72. The range of MBL change was from -0.55 mm to 1.6 mm (Mean: 0.19 ± 0.58 mm). The findings of present study suggest that the implant paced after alveolar ridge preservation appear high survival rates and stable MBL. 임플란트의 생존을 예측하기 위해 초기고정을 측정하는 방법 중 Periotest®는 전자식으로 제어되는 metal rod가 치아 또는 임플란트와 접촉 후 돌아오는 시간을 계산하여 Periotest value (PTV)라는 수치로 변환시켜주는데 -8부터 50까지의 수치를 나타내게 된다. 낮은 수치를 나타낼수록 고정력이 높은 것을 의미하며 Chavez 등11은 in vivo 실험에서 임상적으로 동요도 없이 성공적인 임플란트의 PTV값은 -6에서 +2를 나타내었고 in vitro 실험에서 PTV값은 동요도가 증가됨에 따라 양의 선형관계를 나타내었다 보고하였으며, Olivé와 Aparicio12는 임상실험을 통해 PTV값은 정량적이고 재현성 있어 쉽게 성공적인 골 유착 여부를 평가할 수 있다고 보고하였다. 따라서 본 연구에서는 단국대학교 치과대학 부속 치과병원 치주과에서 ARP를 시행한 부위에 식립된 단일 종류 임플란트의 일정기간 생존율을 PTV값과 방사선학적 계측을 통해 후향적으로 분석해 보았다. 이번 연구는 2016년 4월부터 10월까지 단국대학교 치과병원 치주과에서 sandblasted, large-grit, acid-etched (SLA) 표면을 갖는 단일 제품의 임플란트(IS II active®, Neo biotech, Seoul, Korea)를 ARP 시행한 부위에 식립한 환자를 대상으로 진행하였다(Approval No. H-1412/012/002). 임신 또는 수유, 암치료를 위한 5년 이내의 방사선 혹은 화학요법, 자가면역 질환, 교원질에 대한 이상 과민증, 관혈적 수술이 금기시 되는 전신질환, 장기간의 비스테로이드 항염증약 복용, 예방적 항생제 필요, 하루 10개피 이상의 흡연, 인접치의 치료되지 않은 치주염을 갖는 환자들은 대상에서 제외하였으며, 위 조건에 부합되는 환자들 중 술 후 5개월 - 24개월(평균 15 ± 4.97개월) 간의 정기적 내원을 한 19명의 환자에 식립된 21개의 임플란트를 조사하였다. 환자의 나이 분포는 19 - 79세(평균 55.5 ± 8.75세)로 남성 9명, 여성 10명의 비율로 구성되었다. 발치 원인은 치주병소 11개, 근관병소 3개, 근관-치주병소 4개, 치근 우식 2개, 치근 파절 1개 였고 상악 10개, 하악 11개가 식립 되었으며 대구치 19개, 견치1개, 전치 1개였다. ARP 시행 후 임플란트 식립까지 평균 3.62 ± 0.59 개월이었고 식립 후 보철 시행 전 점검까지 평균 3.40 ± 1.16 개월이었다. 임플란트 식립 시 PTV값은 -7.2에서 32.5의 범위로 평균 -0.06 ± 8.33이며 보철 시행 전 점검 시 PTV값은 -7.9에서 -1.6의 범위로 평균 -5.75 ± 1.72이었다. 임플란트 식립 후 최소 5개월에서 최대 24개월(평균 15개월) 시점에서 임플란트의 생존율은 100%로 나타났으며 MBL의 변화는 근심 -1.6 mm에서 2.1 mm의 범위로 평균 0.21 ± 0.75 mm, 원심 -1.1 mm에서 1.2 mm의 범위로 평균 0.18 ± 0.53 mm를 나타내었다. 근 원심 평균 MBL의 변화는 -0.55 mm에서 1.6 mm의 범위로 평균 0.19 ± 0.58 mm를 나타내었다(Fig. 1 - 3). Diagrams illustrating the average of mesial-distal marginal bone level of all implants. The marginal bone level was measured at fixture insertion (0 month), and at final recall (final months). 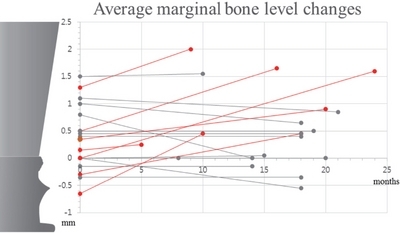 Red lines mean increasing of marginal bone levels. Radiographic evaluation of marginal bone level change of implants which placed in ARP site (Increased MBL after loading). (A) Radiographic image of case 1 (After implant placement), (B) Final recall check of case 1 (21 months later), (C) Radiographic image of case 2 (After implant placement), (D) Final recall check of case 2 (14 months later), (E) Radiographic image of case 3 (After implant placement), (F) Final recall check of case 3 (21 months later). The images cropped from panoramic view. Radiographic evaluation of marginal bone level change of implants which placed in ARP site (Decreased or same MBL after loading). (A) Radiographic image of case 4 (After implant placement), (B) Final recall check of case 4 (24 months later), (C) Radiographic image of case 5 (After implant placement), (D) Final recall check of case 5 (18 months later), (E) Radiographic image of case 6 (After implant placement), (F) Final recall check of case 6 (16 months later). The images cropped from panoramic view. 발치와의 흡수를 줄여 보기 위한 방법으로 발치 후 즉시 임플란트 식립을 통해 치조골의 변화를 줄이려는 노력이 있었는데 동물 연구 실험을 통해 이는 불가능하다 결론지었고,17,18 이에 따라 주목받게 된 ARP는 자가골(Autobone), 탈회동결건조골(Demineralized freezedried bone allograft),19 생활성 유리(Bioactive glass),20 합성 중합체(alloplastic poylmers),21 DBBM 등22의 다양한 재료들을 통한 연구가 진행되어왔다. 이들 중 DBBM을 이용한 연구에서 Artzi 등23은 발치와 내 DBBM을 적용 후 9개월 뒤 조직학적 분석을 시행한 결과 흡수되지 않은 이식재들이 관찰되었고 발치와 내부 82.3%의 신생골 형성을 확인하였다 보고하였다. 해당 연구에서는 장기간의 추가적인 연구를 통해 흡수되지 않은 이식재들의 변화양상을 더 관찰해야 할 것으로 결론지었으나, ARP의 주된 목적인 발치와의 발치 전 상태를 유지하기 위해 이식재가 흡수되지 않는 것은 공간유지능력 측면에서 매우 유리할 것으로 사료된다. 또한 신생골의 적절한 형성이 확인되었고 이는 골유도능이 충분한 것으로 사료되어 본 연구에서는 DBBM을 이식재료로 사용하게 되었다. ARP의 시행에 있어 발치와 상부 연조직의 피개를 이루는 방법은 발치 후 즉시 임플란트 식립 시 연조직의 완전한 피개가 어려울 경우 사용하던 술식들을 이용해왔다. Becker 등24은 협측 판막을 치관측으로 재위치 시키는 방법으로 발치와의 피개를 이루는 방법을 소개하였고 Rosenquist25는 협측 유경판막을 형성하여 이를 회전시켜 피개하는 방법을 소개하였다. Jung 등26은 2 - 3 mm 두께의 구개측 유리 치은을 펀치로 채득하여 발치와 상부를 피개하는 방법을 소개하였다. 그러나 이러한 방법들은 인접 연조직의 추가적인 처치가 필요하며, 이는 환자의 불편감 증가를 유발할 수 있다. 따라서 본 연구에서는 덜 침습적인 방법으로 흡수성 차폐막을 이용해 발치와를 피개하는 방법을 선택하였는데, Cardaropoli 등27은 발치와 내에 이식재를 적용 후 상부에 일차봉합(primary closure)을 이루지 않고 흡수성 차폐막을 적용하여 ARP를 시행한 후 4개월 뒤 임상적, 조직학적으로 분석 했을 때 성공적으로 치조제 흡수를 줄일 수 있었고 임플란트 식립에 적합한 신생골 형성을 관찰할 수 있다 보고하였다. 또한 Engler-Hamm 등28은 ARP 시행 시 흡수성 차폐막을 적용 후 일차봉합을 이루지 않은 경우가 더 많은 각화 치은을 보존하게 되고 치조제 폭경의 소실이 더 적었다 보고한 바 있다. Choi 등29은 두 겹의 차폐막을 통한 피개(double layer coverage)를 통한 ARP 시행 시 골 흡수 량 측면에서 한 겹의 차폐막을 통한 피개에 비해 통계적으로 유의한 우월한 결과를 나타내지는 않았으나, 구강내 노출된 외부 차폐막의 빠른 분해를 내부 차폐막이 상충해 줄 수 있고 치유 능력이 떨어져 발치와의 연조직 치유가 느린 환자에 있어 잠재적으로 유리할 것으로 사료된다 보고하였다. 이 결과를 토대로 본 연구에서는 두 장의 차폐막을 통해 발치와를 일차봉합 없이 피개하기로 결정하였다. 차폐막의 위치를 유지시키기 위해 발치와를 봉합하는 방법으로 기존의 많은 ARP 연구들에서 대부분 crossed mattress suture30 또는 cross suture31를 시행하였으나 본 연구에서는 Hidden X suture를 시행하였다. Park 등13은 기존의 연구에서 사용된 봉합들은 협측 각화 치은 폭경을 줄어들게 만들고 치은치조점막경계(Mucogingival junction)를 설측으로 이동시킨다는 단점이 존재한다 설명하며 Hidden X suture를 소개하였다. 기존의 봉합들은 협 설측 방향의 벡터가 발생하나, Hidden X suture의 경우 근 원심 방향의 벡터가 발생되어 협측 치은이 설측으로 당겨지지 않으면서 차폐막의 위치를 유지시켜줄 수 있고 결과적으로 치은치조점막경계의 위치변화와 각화 치은양의 변화가 유의하게 줄어들었다 보고하였다. MBL 계측 시 전체 임플란트 중 6케이스에서 근 원심 모두 양의 값을 나타내었고 근심 또는 원심에서 양의 값을 나타낸 케이스가 각각 1개씩 있어 식립 직후보다 증가된 MBL 값을 나타내었다(Fig. 2). 또한 방사선 사진상 임플란트 주위 골이 더 광화되어 보이는 방사선 불투과상을 확인하였다(Fig. 2, 3). 이러한 경향은 ARP 시 이식된 골이 일정 수준의 골유도능을 가져 시간이 지남에 따라 신생골의 형성이 계속적으로 지속된 것으로 추정된다. MBL이 증가된 양상 또한 신생골이 임플란트 표면을 자라 올라갔다고 해석하기보다는 방사선 투과상을 나타낼 정도의 낮은 신생골 밀도를 나타내던 이식 부위의 신생골 밀도가 증가되며 보다 명확한 방사선 불투과상을 나타내었다 해석할 수 있다 사료된다. 향후 이러한 결과에 대해 조직학적 소견을 포함한 추가적인 연구가 필요할 것이다. 본 연구에서는 디지털 파노라마 사진을 이용한 계측을 시행하였는데, Vazquez 등32은 임플란트와 금속 공을 이용한 디지털 파노라마의 정밀도에 대한 연구에서 임플란트의 방사선 사진 상 수직적 변형율은 0.9%로 이는 0.1 mm의 오차이며 실제 임플란트 길이와 통계적으로 유의한 차이는 없었다고 보고하였다. 본 연구에서는 디지털 파노라마 방사선 사진을 이용하여 MBL을 측정하였기에 정밀도와 재연성을 얻기 용이하였으나 이차원적 사진이라는 한계점이 있다. 추후 진행될 연구에서는 CBCT를 이용한 삼차원적 계측 및 보다 선예도 높은 정밀한 측정이 필요로 할 것으로 사료된다. 또한 표본수가 적고 관찰 기간이 짧아 장기간의 성공적인 예후 등의 결과를 예지성 있게 신뢰하기는 부족했다. 이에 연구의 신뢰도를 높이기 위해 더 많은 표본 수를 통한 장기간의 연구 결과가 필요할 것으로 사료된다. 이번 연구를 통해 다음과 같은 결론을 내렸다. 발치와를 두 겹의 차폐막으로 피개하고 Hidden X suture를 시행한 ARP에 식립된 임플란트는 높은 생존율을 나타낸다(100%). ARP 시행 후 식립된 임플란트의 MBL은 평균적으로 증가된 수치를 나타낸다. DBBM을 통해 ARP를 시행한 부위는 지속적인 신생골 형성에 따른 방사선학적 광화가 관찰된다. 비록 한계점이 있는 연구이나, 위의 결과로 미루어 보아 ARP를 시행 한 부위는 임플란트 식립에 적절한 새로운 골을 형성하여 식립된 임플란트의 적절한 초기고정 및 생존율을 나타내며 안정적인 변연골 유지를 보이는 것으로 사료된다. This present research was conducted by the research fund of Dankook University in 2016 (R-2016-00430). Schropp L, Wenzel A, Kostopoulos L, and Karring T. Bone healing and soft tissue contour changes following single-tooth extraction:a clinical and radiographic 12-month prospective study. Int J Periodontics Restorative Dent 2003;23:313-23. Ten Heggeler JM, Slot DE, and Van der Weijden GA. Effect of socket preservation therapies following tooth extraction in non-molar regions in humans:a systematic review. Clin Oral Implants Res 2011;22:779-88. Chiapasco M, and Zaniboni M. Clinical outcomes of GBR procedures to correct peri-implant dehiscences and fenestrations:a systematic review. Clin Oral Implants Res 2009;20:113-23. Vignoletti F, Matesanz P, Rodrigo D, Figuero E, Martin C, and Sanz M. Surgical protocols for ridge preservation after tooth extraction. A systematic review. Clin Oral Implants Res 2012;23:22-38. Avila-Ortiz G, Elangovan S, Kramer KW, Blanchette D, and Dawson DV. Effect of alveolar ridge preservation after tooth extraction:a systematic review and meta-analysis. J Dent Res 2014;93:950-8. MacBeth N, Trullenque-Eriksson A, Donos N, and Mardas N. Hard and soft tissue changes following alveolar ridge preservation:a systematic review. Clin Oral Implants Res 2017;28:982-1004. Araújo MG, Silva CO, Misawa M, and Sukekava F. Alveolar socket healing:what can we learn?. Periodontol 2000 2015;68:122-34. Mardas N, Trullenque-Eriksson A, MacBeth N, Petrie A, and Donos N. Does ridge preservation following tooth extraction improve implant treatment outcomes:a systematic review:Group 4:Therapeutic concepts &methods. Clin Oral Implants Res 2015;26:180-201. Corrente G, Abundo R, Cardaropoli D, Cardaropoli G, and Martuscelli G. Long-term evaluation of osseointegrated implants in regenerated and nonregenerated bone. Int J Periodontics Restorative Dent 2000;20:390-7. Nevins M, Mellonig JT, Clem DS, Reiser GM, and Buser DA. Implants in regenerated bone:longterm survival. Int J Periodontics Restorative Dent 1998;18:34-45. Chavez H, Ortman LF, DeFranco RL, and Medige J. Assessment of oral implant mobility. J Prosthet Dent 1993;70:421-6. Olivé J, and Aparicio C. Periotest method as a measure of osseointegrated oral implant stability. Int J Oral Maxillofac Implants 1990;5:390-400. Park JC, Koo KT, and Lim HC. The hidden X suture:a technical note on a novel suture technique for alveolar ridge preservation. J Periodontal Implant Sci 2016;46:415-25. Buser D, Weber HP, and Lang NP. Tissue integration of non-submerged implants. 1-year results of a prospective study with 100 ITI hollow-cylinder and hollow-screw implants. Clin Oral Implants Res 1990;1:33-40. Buser D, Mericske-Stern R, Bernard JP, Behneke A, Behneke N, Hirt HP, Belser UC, and Lang NP. Longterm evaluation of non-submerged ITI implants. Part 1:8-year life table analysis of a prospective multi-center study with 2359 implants. Clin Oral Implants Res 1997;8:161-72. Buser D, Mericske-Stern R, Dula K, and Lang NP. Clinical experience with one-stage, non-submerged dental implants. Adv Dent Res 1999;13:153-61. Araújo MG, Sukekava F, Wennström JL, and Lindhe J. Ridge alterations following implant placement in fresh extraction sockets:an experimental study in the dog. J Clin Periodontol 2005;32:645-52. Blanco J, Liñares A, Pérez J, and Muñoz F. Ridge alterations following flapless immediate implant placement with or without immediate loading. Part II:a histometric study in the Beagle dog. J Clin Periodontol 2011;38:762-70. Becker W, Becker BE, and Caffesse R. A comparison of demineralized freeze-dried bone and autologous bone to induce bone formation in human extraction sockets. J Periodontol 1994;65:1128-33. Froum S, Cho SC, Rosenberg E, Rohrer M, and Tarnow D. Histological comparison of healing extraction sockets implanted with bioactive glass or demineralized freeze-dried bone allograft:a pilot study. J Periodontol 2002;73:94-102. Serino G, Biancu S, Iezzi G, and Piattelli A. Ridge pres-ervation following tooth extraction using a polylactide and polyglycolide sponge as space filler:a clinical and histological study in humans. Clin Oral Implants Res 2003;14:651-8. Nevins M, Camelo M, De Paoli S, Friedland B, Schenk RK, Parma-Benfenati S, Simion M, Tinti C, and Wagenberg B. A study of the fate of the buccal wall of extraction sockets of teeth with prominent roots. Int J Periodontics Restorative Dent 2006;26:19-29. Artzi Z, Tal H, and Dayan D. Porous bovine bone mineral in healing of human extraction sockets. Part 1:histomorphometric evaluations at 9 months. J Periodontol 2000;71:1015-23. Becker W, and Becker BE. Guided tissue regeneration for implants placed into extraction sockets and for implant dehiscences:surgical techniques and case report. Int J Periodontics Restorative Dent 1990;10:376-91. Jung RE, Siegenthaler DW, and Hammerle CH. Postextraction tissue management:a soft tissue punch technique. Int J Periodontics Restorative Dent 2004;24:545-53. Cardaropoli D, and Cardaropoli G. Preservation of the postextraction alveolar ridge:a clinical and histologic study. Int J Periodontics Restorative Dent 2008;28:469-77. Engler-Hamm D, Cheung WS, Yen A, Stark PC, and Griffin T. Ridge preservation using a composite bone graft and a bioabsorbable membrane with and without primary wound closure:a comparative clinical trial. J Periodontol 2011;82:377-87. Choi HK, Cho HY, Lee SJ, Cho IW, Shin HS, Koo KT, Lim HC, and Park JC. Alveolar ridge preservation with an open-healing approach using single-layer or double-layer coverage with collagen membranes. J Periodontal Implant Sci 2017;47:372-80. Cardaropoli D, Tamagnone L, Roffredo A, Gaveglio L, and Cardaropoli G. Socket preservation using bovine bone mineral and collagen membrane:a randomized controlled clinical trial with histologic analysis. Int J Periodontics Restorative Dent 2012;32:421-30. Jung RE, Sapata VM, Hammerle CHF, Wu H, Hu XL, and Lin Y. Combined use of xenogeneic bone substitute material covered with a native bilayer collagen membrane for alveolar ridge preservation:A randomized controlled clinical trial. Clin Oral Implants Res 2018;29:522-9. Vazquez L, Nizamaldin Y, Combescure C, Nedir R, Bischof M, Dohan Ehrenfest DM, Carrel JP, and Belser UC. Accuracy of vertical height measurements on direct digital panoramic radiographs using posterior mandibular implants and metal balls as reference objects. Dentomaxillofac Radiol 2013;42:20110429.